Here are several team shooting drills that we like. We rotate these drills from practice to practice, trying to avoid boredom from the same old drill. Shooting Drill 1: "12 Sets"
Have players partner-up and use all of your baskets. Each player will shoot 12 sets of shots. Each set consists of a 3-pointer (yellow), a shot-fake with jump shot (green), a catch and shoot jump shot (blue), and a lay-up (pink). We start in one corner and rotate around each of the 12 spots (seen in black in the diagram). The partner rebounds and passes back to the shooter. We rotate shooters after each set of four, so the shooter becomes the rebounder and vice-versa. This is a fun competitive drill. Have players partner-up and use all of your baskets. Each player will shoot nine sets of shots (see diagram). Each set consists of a 3-pointer, a shot-fake with jump shot, and a lay-up. We start in one corner and rotate around each of the nine spots (seen in black in the diagram). The partner rebounds and passes back to the shooter. We rotate shooters after each set of "3-2-1", so the shooter becomes the rebounder and vice-versa. The two players compete against each other and keep track of their individual scores. Each made 3-pointer = 3 points, a jump shot = 2 points, and a lay-up = 1 point. The loser does push-ups. This is another fun, challenging drill. We use both baskets with half of the team at each end. Each player will shoot nine sets of shots. We start in one corner and rotate around each of the nine spots (seen in black in the diagram). Each set consists of a 3-pointer and a mid-range jump shot. A rebounder rebounds the 3-point shot and passes back to the shooter who shot fakes and shoots a mid-range jumper. After the jump shot, the shooter becomes the rebounder for the next shooter. Each player keeps track of his/her own score. Three-pointers = 3 points and mid-range jumpers = 2 points. A perfect score would be 45 (nine 3's and nine 2's). Each player must try to achieve a score that you set for them (for varsity, we use a score of 28). Any player who does not achieve the target score does push-ups. We intentionally make the target score somewhat difficult to achieve, so a lot of players usually end up doing push-ups! 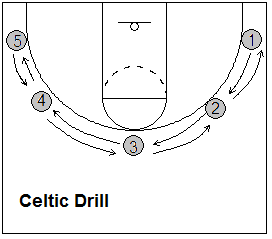 Shooting Drill 4: "Celtic Drill"
This drill comes from Archie Miller (see video below). You can do this with two or three players... one shooter and the other(s) rebounding for the shooter. The shooter starts in one corner (see diagram below). There are five shooting spots. He/she must make two in a row at each spot before moving on to the next spot. Once the shooter reaches the opposite corner and makes two there, he/she then stays there and makes two more and moves on. The goal is to get all the way around and back within two minutes. If a player makes it in less than two minutes, the time is recorded and then next time he/she will try to beat the previous record. Also, if the shooter gets around in less than two minutes, he/she keeps going for the entire two minutes to see how far he/she can get... maybe to spot 12 or 13 for example. Shooting Drill 5: "Evans Drill"
There are five perimeter 3-point arc spots - right corner, right wing, point (top), left wing and left corner (same spots as in the Celtic drill above). The shooter starts in the right corner and keeps shooting at that spot until he/she misses two in a row. After missing two in a row, the shooter moves to the next spot (right wing) and shoots there until two consecutive shots are missed. The same rule applies to each of the five spots. After missing two in a row in the left corner, that shooter's round is finished. Keep track of how many shots are made and players can compete against each other and also for your team's "all-time record". Shooting Drill 6: "Team Shooting"
We use two lines. The shooting line is at the point. The wing passes to the shooter who takes the 3-point shot, follows his shot, gets the rebound and goes to the passing line. Passers move to the shooting line. Everyone will shoot two "3's". Next, the shooter will receive the pass, shot fake, take one or two dribbles and shoot the jump shot. Everyone shoots two jumpers. Next, our shooter will start at the free-throw line, cut outside and then back-cut to receive the pass for a pull-up jump shot. Everyone does two of these. Next, the shooter again starts at the free-throw line, cuts outside, back-cuts, receives the pass and dribbles in for the lay-up. After completing this rotation, we will move the passing line to the left wing and repeat all the same shots with the pass coming from the left wing. Shooting Drill 7: "Rayder Shooting"
Shooting Drill 8: "3-Man, 2-Ball Shooting Drill"
Shooting Drill 9: "Close-out Shooting Drill"
Shooting Drill 10: "Ball-Screen and Flare Shooting Drill"
Shooting Drill 11: "Cutter Shooting Drill"
Shooting Drill 12: "Endline Cutter Shooting Drill"
with Mike Krzyzewski, Duke University Head Coach, Naismith Memorial Basketball Hall of Fame.